If you’ve ever looked at a tennis court, it’s easy to be confused by all the different lines that mark out the playing area. Then you watch an actual game being played and it’s even harder to comprehend what all those different sections represent! This isn’t the easiest topic to consider without a PowerPoint presentation, but we’re going to take a shot at explaining tennis court dimensions and how they apply to the game. 2 What are the Dimensions of a Full-Size Tennis Court? 3 Does the Surface Change Anything? Modern Tennis evolved out of the game of Real Tennis, which was popular in England and France during the 16th Century (Henry VIII was pretty good at it, by all accounts). Real tennis courts were unusual things, rather longer than modern courts (around 110 feet or so), and laid out completely differently at each end. Real Tennis was hideously complicated and very difficult to play; as a result, it was rapidly replaced when “lawn tennis” (what we just call “tennis” today) came along. What are the Dimensions of a Full-Size Tennis Court? The size of a tennis court is a deceptively complicated question. Do you consider the court to just be the space marked out on the ground, or do you include the playing area around the marked court that the players will run on? Does a tennis court have air-space? Thankfully, Britain’s Lawn Tennis Association has full guidance to explain how it should all work. How long is a tennis court? Surprisingly long, is the answer! The 2106 / 2808 square feet only includes the marked playing area, though. If you’ve ever watched a match yourself, you’ll know how the players these days will often stand way back behind the baseline, and, when rallies get right in close to the net, end up dashing off to the side in order to reach the ball. That’s why ITF say you generally want at least 12 feet between the sideline and the edge of the playing area, and at least 21 feet of space beyond the baseline. Therefore, the recommended dimensions for a full tennis court ought to be 120ft by 60 ft. at a minimum, leading to a grand total of more than 7,000 square feet. This gives the players plenty of room to serve from and space to overrun at the sides, without fear of sprinting headfirst into a wall. 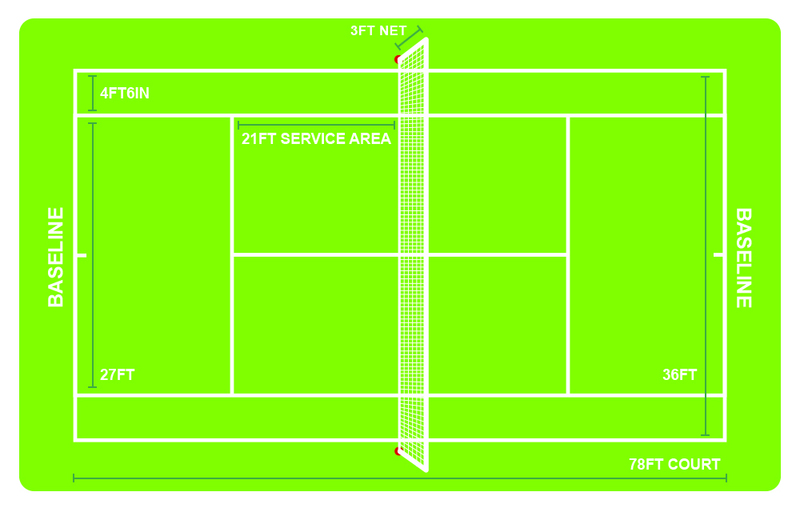 Courts with linesmen and umpires will generally add an extra 10 feet to each side in order to fit them in. It also means that less than half of the “court” is the bit marked out in the middle. It’s sometimes easy to forget, but in tennis height is almost as important as length and width. For an indoor court, you need an unobstructed clearance of at least 35 feet at the midpoint and 20 feet at either baseline. If your court is outdoors (and free of overhanging trees), then quite literally the sky is the limit. However, to protect yourself from lost balls, it’s normally wise to install a fence to between 10 or 12 feet in height. Does the Surface Change Anything? There are then a number of artificial surfaces that amateur clubs or courts will use to more cheaply simulate the effect of playing on one of these three surfaces. Whilst the style of tennis played on the different surfaces varies significantly, the court itself remains exactly the same. A clay tennis court at Rolland Garros is exactly the same dimensions as the grass courts of Wimbledon. Well, yes. What we’ve outlined above are full-sized pro courts, of the kind that Rafael Nadal would feel comfortable playing on. Plenty of tennis clubs will have smaller courts for junior players, in which case exactly the same ratio of dimensions will be used, just scaled down. Plenty of private players have slightly smaller courts at home, too, but they forego the Lawn Tennis Associations’ stamp of approval. The markings on a tennis court generally represent where the ball is allowed to go during a given part of the game. Players themselves can (and often do) stand way outside of the marked lines, whilst the tennis ball itself can go anywhere it likes whilst in the air, it just needs to land within the correct demarcated area. The most important areas marked on the court are the conjoined “service boxes” (21 feet by 13.5 feet) on either side of the net. When a player is serving from one side of the court, they must ensure that the ball travels over the net and lands in the service box diagonally opposite. In doubles, because you have more players on court, the box is broadened out by an extra 4.5 feet to include the “tramlines” (the narrow strips that flank each side of the court). After that first short, for the rest of the rally a ball is called “in” as long as it lands within the main court (78 feet by 36 feet). The lines themselves need to be at least 2 inches wide (although the baseline can be double that in thickness), and all of the measurements should always be made to the outside of the line. This is why, in tennis, a ball is called “in” if it touches even the tiniest fraction of the marked line. Every bit of it is within the bounds of the court. Now you know all about the court get yourself a decent racquet and get playing!